Reports have surfaced over last day or so about self-reported issues with the Sharkies Salary Cap. Interestingly their ‘self-reporting’ says the problems were for 2015 AND 2017, and not this year, OR FOR THEIR PREMIERSHIP WINNING 2016!!! A bit serendipitous for this little black duck! bit like tellin the missus you only had two beers round the pub ain’t it? No major sponsor again as well. Surely their time as a club is numbered. I for one would not shed a tear. The NRL has to be considering their options here. Maybe even a takeover of the clubs licence. Even with the development, they are going to struggle considering the massive debt hole they have made. I dare say their days are numbered. I don’t think they would relocate the Sharks anyway. If anything were to happen I would imaging the NRL Licence will be stripped and they would be offered a place in the NSW Competition and the license assigned to a new club (my guess would be Perth). This would be follow with a 2 team expansion outlined in a new TV deal. need to get their house in order or suffer the consequences. I won’t lose any sleep regardless of NRL action, if any !!! Agree Puss, enough is enough ! The gift that keeps on giving has given us more - apparently a number of other salary cap discrepancies have been found. Even more sanctions to come. This is why I had the Sharks placed in the bottom floor. If the article in the Sydney Morning Herald are to be believed, the NRL have found further unreported breaches to the salary cap, and the Sharks are set to be slapped with an additional $500k reduction in this years salary cap. Under the NRL’s “last man in, first-man out” rule, Shaun Johnson will be unable to play until the club is Salary Cap compliant. This would require the Sharks to release players into a competition where team are just a week or two away from Round 1 and already have their squad finalized. On top of this, I heard rumours that the Sharks “development” is running way behind schedule, and with the downturn in the economy and housing market, investor are looking to pull out. If your developer you would be quietly thinking to yourself that if the Sharks tank and lose their licence, it would be good for the developer. The Sharks own the loud stadium right next to the development, and if the club were to go broke, acquiring the stadium and the club in an asset sale would solve the problem of noise from the stadium and give them more land to develop on. Salary cap penalty in the region of $500,000 (manybe over multiple years). More breaches of the salary cap were found than were “self-reported” by Cronulla. Heavy fine to be handed down in addition from the NRL. Segeryaro now the “last-man”. Speculation he was put on to allow Johnson to play. Sharks will have to likely shed a player. Flanagan to learn the fate of his appeal over his deregistration from the NRL later in the week. Cronulla will learn its fate from the long-running salary cap probe after this week's Australian Rugby League Commission meeting. Just shut them down already and take the licence, this has been going on for decades at Cronulla. From cap in hand begging the league for money and exemptions, to the scandals we see before us today. Clubs in far better standing (Adelaide Rams for example) had their licences revoked. It’s time this ends. Is it wrong that I’m enjoying this? No. 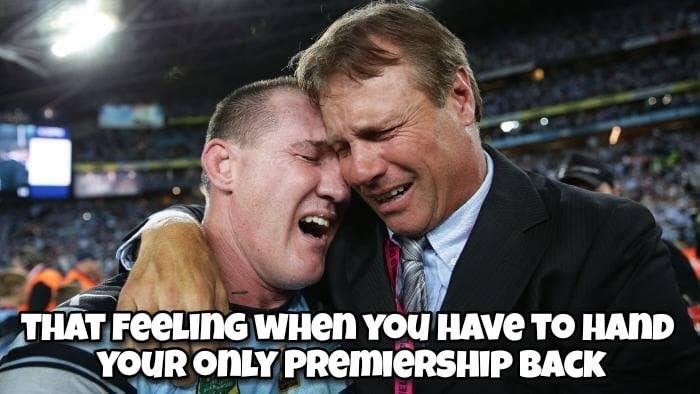 The Sharks have asked for exemptions, leniency, and bailouts since back in the NSWRL days. It’s good to see it may all be coming to an end. Sympathy if it was the Eels…what a weirdo!! You are a cruel lot! Shame on you all! Now does anybody agree wit me that the Sharks should be stripped of their 2016 Premiership?